If you’re a born minimalist or just somebody with a small desk, you can’t do much better than the TypeMatrix. It’s one of the smallest keyboards you can buy, yet includes almost all of the commonly used keys and a strikingly usable numeric keypad. Plus – if you listen to TypeMatrix – it’s ergonomically beneficial as well. 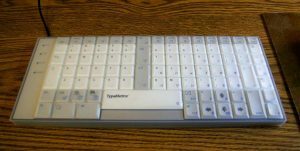 The flagship feature of the TypeMatrix 2030 is the improved layout of its keys. Look down at your keyboard. Notice something odd about the way the key rows are staggered? Neither do most people. We just expect that C, for instance, doesn’t line up exactly with D, and U doesn’t line up exactly with J. While this might seem like some kind of ergonomic innovation, it turns out that there’s nothing innovative about it. Like QWERTY itself, the staggered layout is a holdover from the days of manual typewriters, when the keys had to be staggered to leave room for their mechanical arms. Unlike QWERTY, this ancient holdover can be changed without too much inconvenience for the user. 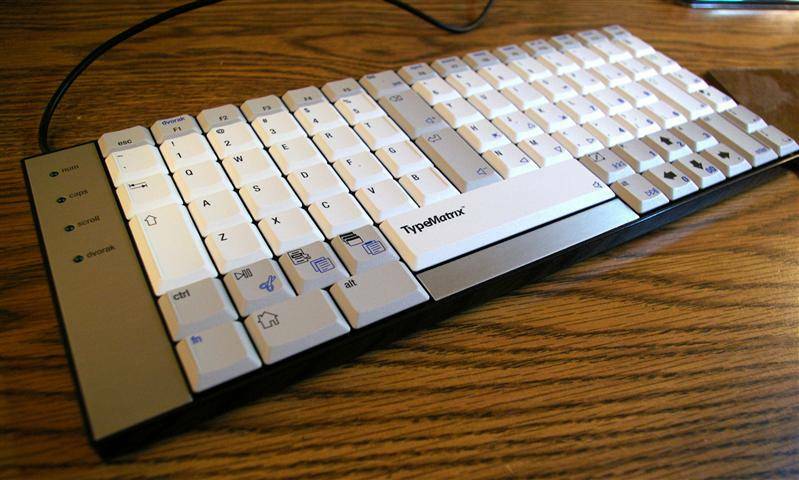 The TypeMatrix design straightens out the staggered keys, giving the keyboard a simple grid layout. But that’s not all. To further transfer some typing load away from the weaker pinkie fingers, TypeMatrix also moved some important keys. Enter, Backspace, and Delete are now in a straight column down the center of the keyboard. Personally I think this is a good idea, but it takes some getting used to – as do numerous other tweaks to the positions of keys like Ctrl, Alt, and Backslant. 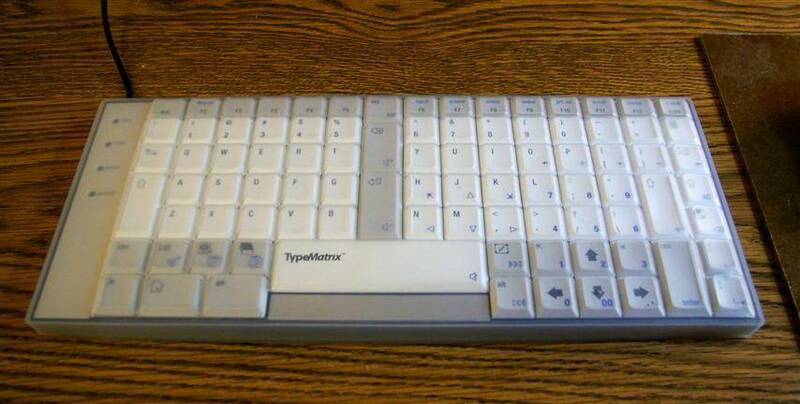 Some people have reported typing clumsily for weeks after switching to the TypeMatrix. I was able to go fairly fast on it right away, though I had to look at my hands for accuracy. The biggest problem I experienced was with the right Shift key, which is further away than I’m used to. When I tried to type, for instance, the word “TypeMatrix,” I ended up with “\typeMatrix” instead – Backslant being where my pinkie expected to find Shift. Narrow keyboards usually try to implement ten-key the same way it’s done on a laptop: They make the numeric keypad an alternate overlay on the right side of the board. There’s just one problem with this. Because of the staggered layout we discussed earlier, the numbers don’t line up with each other like a good ten-keyer expects. This makes it challenging to use and a poor substitute for a real numeric keypad. The TypeMatrix grid layout changes all that. The numeric keypad characters now line up exactly as they do on a standard keyboard. Just hit Num at the top right and you’ll be right at home. The 2030 even has one useful numeric key that isn’t found on most boards, a dedicated double-zero – great for entering dollar amounts. The TypeMatrix 2030 is only 12.75″ wide, making it one of the smallest keyboards available. The resulting increase in desk space can really help to bring everything within reach – particularly your mouse. Standard keyboards are usually 15″-20″ wide, leaving you the choice of either pushing your mouse too far away or off-centering the keyboard. Both choices are bad and can result in various problems with your elbow and wrist. This is one of the biggest problems that can be solved with a small keyboard like the TypeMatrix. Having a low profile keyboard is usually good for ergonomics too. The 1/2″-thin profile of the 2030 makes it that much easier to get your keyboard down to elbow height or below, particularly if you are stuck with a less-than-ideal desk setup. One word of warning though: Don’t try to use a standard palm rest with the TypeMatrix; it will almost certainly be too thick. One thing I really don’t like about my Kinesis Freestyle is its lack of portability. Two separate keying modules with elaborate foot assemblies are awkward to scoot across the desk, much less stuff into a laptop bag. The TypeMatrix has no such drawback. It’s both small and sturdy, and would easily fit into the most modest briefcase, bag, or backpack. This could be important if you work on several different computers. Those of us who eat at our desks have a dilemma. Food is unappealing without something to drink, but computer keyboards don’t like to get wet. Some of them really don’t like it. I discovered this the hard way a few years ago, when I tipped a bottle of cold tea into my Microsoft Natural Elite. As I recall now, I did everything you’re supposed to do. I unplugged the keyboard at once, inverted it, disassembled it, and got the inside completely dry before hooking it up again. Despite all these efforts, several letters were gone forever; my keyboard had abruptly reached the end of its useful life. You can get a Microsoft Elite for about $20 off eBay, so this wasn’t a particularly expensive accident. In the case of a higher-end keyboard, though, such a mishap could be very expensive. In what I think is a pretty cool touch, TypeMatrix offers various rubber “skins” for the 2030. Made of thoroughly waterproof and washable silicone, they’re perfect for protecting the keyboard from dust, wear, and ham-handed coffee drinkers. I can also see a place for this in laboratories, industrial facilities, art studios, restaurants – the list goes on. Sure, you can buy a roll-up rubber keyboard for a lot less money, but the mushy action on those things is a joke. The rubber coating on the TypeMatrix 2030 can actually improve an already-good typing experience – more on that later. Many typing enthusiasts consider keyboard noise a thing of beauty. Some even love it so much that they go out and buy a Das Keyboard, which is specifically marketed as one of the planet’s noisiest. Coworkers, and others who have to listen to this “beautiful” sound, tend to share a different view – just as extreme, but in the other direction. If you want to maintain popularity among those within earshot of your typing, the TypeMatrix is your friend. To start with, the keyboard itself is reasonably quiet, with about the noise level of a laptop. But when you add a rubber skin, even that small amount of noise is almost eliminated. A TypeMatrix with a rubber cover is probably the closest thing you’ll find to a silent keyboard – short of a touch device like the iPad. If you’ve typed on a typical good-quality laptop, you’ve experienced pretty much the same thing as a TypeMatrix. The keys are a bit softer and springier than those on my HP notebook. Add a rubber cover, and those keys become softer still – but in a good way. If you find the action of other keyboards jarring, the gentle presses of a TypeMatrix 2030 may be just what you need. High efficiency QWERTY alternatives like Dvorak aren’t for everybody, but they do have their fans – particularly among those whose living depends on their typing speed. Normally Dvorak users have to customize every computer they use, and change it back again if it’s a shared system. The TypeMatrix 2030 makes things much easier, because it doesn’t rely on the computer’s OS for Dvorak capability. Instead, there’s a smart chip on the board itself that toggles between QWERTY and Dvorak when you press Fn-F1. Additionally, you don’t have commit to an alternate layout by buying a special version of the keyboard, or worry about changing keycaps. Instead, you can order a rubber keyboard skin reflecting the layout you want. You can even order a completely blank skin for an unlettered keyboard, just like the ones they used in old time typing classes. Most keyboards feature some kind of plastic “bump” on the index finger home keys, to help touch typists find their starting positions without looking. The TypeMatrix has such bumps not only on the J and F, but also on Numeric 5, Numeric 00, and the Delete key. This is fine in concept, but there’s a problem with those dots – they’re sharp. Sitting here typing on a brand-new 2030, my index fingers are getting quite uncomfortable from sliding over the little pinpoints. The good news is, a rubber skin softens up the dots considerably. If you want to use the keyboard without a cover, and you have sensitive hands like mine, you may have to put up with some discomfort until natural wear rounds off the dots. You could also put a tiny piece of tape on each one, or sand them down with a Dremel tool (though I’m pretty sure the latter would void your warranty). In my opinion, every keyboard that comes with an ordinary computer should be more like the Typematrix 2030. Its ergonomic features – straight grid layout, small size, and reduced pinkie use – are all basic but helpful. Most importantly, the keyboard is not some weird-looking device that will scare users with a steep learning curve. Though small and deceptively simple-looking, the TypeMatrix 2030 is really quite an innovation. Disclosure: This review was made using a complimentary sample from TypeMatrix, which I gave to another person after finishing the review.